Farmers have reacted angrily to high profile advertisements from Go Vegan World (GVW) claiming ‘humane dairy is a myth’. The adverts appeared in The Telegraph yesterday (February 26) and have also been seen on billboards and taxis around the country. I won't be rushing out to buy the telegraph again! The whole back back page. On February 5, the newspaper also ran a full page advertisement with the slogan ‘Dairy takes babies from their mothers’. 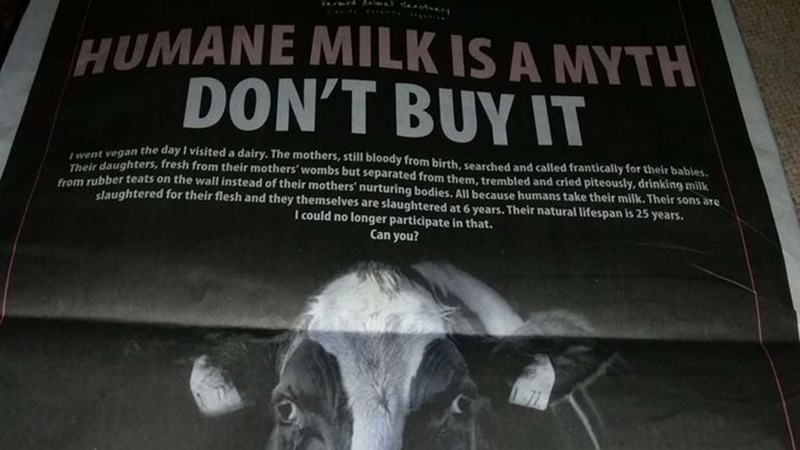 NFU dairy board chairman Michael Oakes said as a dairy farmer seeing adverts like this in the press was ‘disheartening’. “It makes you angry. We are really conscious of their welfare,” he said. “The way we look after them is key. The last thing we want is any animal suffering. Following an open letter from Mr Oakes to the newspaper, GVW hit out at the union and said it was ‘entirely missing the point’ of veganism. GVW campaign director Sandra Higgins said: “Veganism is about justice. Justice can’t be accorded to others unless we are willing to swap places with them. She said farmers had ‘no need’ to feel threatened by veganism. “We will need and value farmers more than ever in a vegan world."